According to author and long-time advisory consultant Ken Gonzalez, leadership is not a spectator sport, you need to actually try being a leader in order to become one. Ken also says that leadership now matters far more than management. Larry Cooper says that anyone at any level can be a leader - the real role of existing leaders is to nurture and create new ones. Larry also believes that when an organization’s leaders no longer have to make any day-to-day decisions is the point at which they will have achieved true leadership agility. So with all the talk about leadership agility and how leadership is now more valued than management, how are we to make sense of it all? 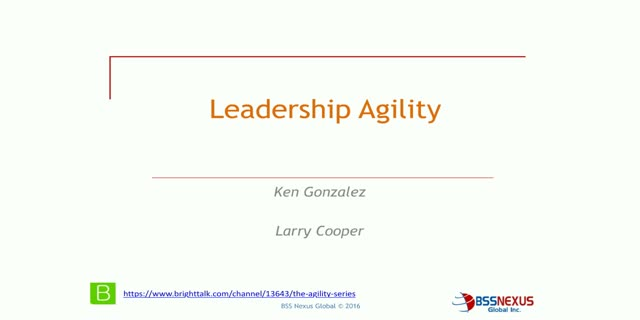 In this lively talk Ken and Larry will explore the differences between leadership and management, why leadership now matters more, the real role of leadership, the challenges to achieving it, and what leadership agility looks like. Finally, they leave you with three key take-away’s for better understanding the premise of true leadership agility. 1. Why are ITSM organizations looking to be more agile? 2. What does it mean for existing frameworks like ITIL? 4. What is the role of tools and techniques such as process hacking to achieving agile service delivery? 5. What are the business benefits and value? The webinar will cover topics that bridge Delivery Agility and Business Agility in The Agility Series. Claire Agutter is the lead tutor for ITSM Zone (www.itsm.zone), providers of high quality, accredited online training for IT professionals. Claire uses her background in service management operations and consultancy to blend old and new best practice to give organizations the toolkit they need to deliver business value. From ITIL to DevOps, OBASHI and Agile Service Management, Claire believes in sharing knowledge and experience between organizations, and hosts the popular ITSM Crowd hangouts that provide practical advice to professionals around the world. Jayne Groll is a Board Member of the DevOps Institute (DOI). She is also President of ITSM Academy. Jayne carries many IT credentials including ITIL Expert™, Certified ScrumMaster, Certified Agile Service Manager, DevOps Foundation and is a Certified Process Design Engineer (CPDE)™ . Her IT management career spans over 25 years roles across a wide range of industries. Jayne is very active in the ITSM, Agile and DevOps communities and is the author of the Agile Service Management Guide. She is a frequent presenter at local, national and virtual events. Change is occurring at unprecedented levels which is leading to uncertainty and trepidation by leaders from the smallest to the largest of organizations. Yet there are some leaders and organizations who seem to thrive, not in spite of these circumstances, but because of them. They have learned to adapt and iterate their strategies just as agile teams do for software development. Ever wondered how to do that in your organization? The Adaptive Strategy Framework is your tour guide for strategic excellence in creating value based on iterative and incremental execution of Strategic Change to realize your organization’s vision and strategies. The framework encourages emergent thinking across Networked Teams and enables strategic adaptability through continuous refinement of an organization’s capabilities. The framework consists of Networked Teams (with roles), events, artifacts, and rules. All attendees will get a link during the webinar to download a free copy of the Framework. The Framework will be made freely available after the launch event though BSSNexus will retain all copyrights. Traditional project management approaches focus on measuring performance in terms of respecting time and cost estimates. Those measures confirm performance after the fact and do not address the main driver of project success: engaged high-performing teams. This webinar, co-hosted by Charlotte Goudreault and Claude Emond, will present the link between continuously engaged teams, superior performance and successful high value project delivery, as well as explain how agile values, principles and tools can help build and develop continuously engaged, high-performing project teams. Charlotte and Claude will also present and demonstrate, using real project data, a simple 3-step approach, based on agile techniques and inspired by their own experiences in projects, that will help you to quickly mobilize your teams (any types of teams, project-oriented or production-oriented) and keep them engaged and high-performing. Those who attend the webinar will be given access to a pdf copy of the presentation slides as well as to a copy of an Excel template that can be used as a support tool to monitor and improve team engagement. As Agile and agile thinking has continued to gain traction in organizations beyond the software development teams, project managers are left wondering what it all means to them. Some Agile practitioners promote the idea the PMs are no longer needed once you make the transition to using a practice such as Scrum. Does this mean that the PM role will become obsolete in Agile organizations? Or does it mean that the role of traditional project manager needs to transform to being a agile project leader? If you are a PM in an organization making the transition to Agile, come find out what it means to you and what you need to do start the transformation to becoming an Agile Project Leader. Join this panel of industry experts as they explore the growing interest and impact of key trends in the IT space including DevOps, Agile, BYOD, Social Media, Metrics and ITaaS. Agile is not new. US rocket scientists applied incremental design and development methods in the 1950’s and IBM taught incremental practices in Los Angeles in the early 1960’s. Despite its extensive history, many people think Agile started with the Agile Manifesto in 2001. The Manifesto’s emphasis on software development also created the misconception that Agile is limited to the software development lifecycle. While some practitioners focus solely on Agile methods, others perceive that Agile’s real value is in the ability of its principles to change our thinking and behaviors. For a growing number of people and the organizations to which they belong, Agile is a strategy that can be successfully applied to any context or industry in any part of any organization. In this webinar, we will review the broad origins of Agile, examine how Agile is permeating all facets of the organization, and consider the far-reaching implications of Agile within ITSM in particular. We will also explore the characteristics of an Agile organization, with an eye towards what needs to change in Agile IT organizations (both in Dev and Ops) by way of focusing on such technical aspects as how to capitalize software product development and how we can make Supplier Management more Agile. Larry Cooper, Senior Partner, BSSNexus Global Inc. This presentation is based on an article Larry wrote in 2007 called “CSF's, KPI's, Metrics, Outcomes and Benefits”. The original article was spawned by an e-mail he had received that purported to describe "The top 50 Critical Success Factors (CSF's) for ITIL". Among the approximately 50 items listed, real CSFs were in the minority as most of the supposed CSFs were in fact metrics, KPIs, benefits or outcomes. These terms - though related, are different; they are often used interchangeably - incorrectly; many people create their own definitions on the fly of what they mean; and, the ITIL books don't help matters as they don't apply them consistently from one volume to the next - or even from one chapter to the next within the same volume! A book released recently through the TSO on Metrics and CSFs falls into the same trap. So no wonder everyone is confused. This webinar provides a level-set for participants as to what each of these terms actually mean based on their origins and how they relate to one another. This will be done within the context of starting with the end (i.e. Outcomes and desired Benefits) in mind. It is only when you know what you are trying to achieve that you can measure the right things. Participants will also be introduced to the concepts of leading versus lagging indicators. Leadership Facilitates. Process Enables. People Deliver. The Agility Series Channel is hosted by Larry Cooper. Larry was the Mentor for the PRINCE2 Agile book, is an author, content creator, and agile educator, and consultant with over 35 years in the industry. The Agility Series channel brings you the latest ideas and research into agility across the organization not just in software and product development. We will have our own speakers as well as special invited guests who will present on topics that will enhance the discussion and our understandings on agility.